Junior's is a Brooklyn landmark, home of the quintessential NY style cheesecake. I recently heard that Junior's is having a recipe contest in honor of its 60h anniversary. Reading about it jogged my memory of a mini-competition I had with my then across-the-street neighbor years ago. She was Italian. Very Italian. Everything she cooked was Italian. I think she didn't even know what a french fry was, she was so Italian (the importance of this fact will become apparent later). "I make a really good cheesecake!" "Really? MY cheesecake is the best!" "Yeah? How many bricks of cream cheese do you use? "Bricks? Cream cheese? What are you talking about? Ricotta is the only cheese in a good cheesecake." I wanted to make a chocolate pudding pie. I was in the mood for comfort food, and chocolate pudding pie is comforting. A little boring, but comforting. 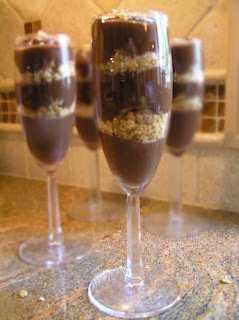 Then I remembered how I once made chocolate mousse in fluted champagne glasses because my entire custard cup collection at the time consisted of 2 large-ish and 3 small pyrex cups (I have since gained one more large-ish cup, "stolen" from my Passover collection. But I digress...). Everyone thought I was serving them some fancy-schmancy chocolate something-or-other because anything served in a wine glass looks très elegant (which is French for "3 times more fancy-schmancy"). No mixer is needed, unless you count yourself, though you will have to stand there stirring and stirring for all of 3-4 minutes to prevent globs of buerre blanc from burning itself permanently to the bottom of the saucepan. Which is not a good thing. I own the bible of Jewish cooking -- The Art of Jewish Cooking by Jennie Grossinger, of Grossinger's Hotel fame. According to Jewish Virtual Library, she built the hotel up from a 35 acre farm, where her parents took in borders to make ends meet, to a 1,200 acre, 35 building resort that hosted 150,000 people a year when she finally retired. Unfortunately, both Jennie and the hotel are long gone, but her cookbook in paperback form still remains available. I own the hard cover version, food splattered, cover ripped and notes all over the pages from tweaking recipes over the years. One recipe I haven't had to adjust (much), is Honeyed Carrots. Simple and easy, yet delicious enough to serve during any holiday. Since it calls for honey (for a sweet new year, yadda, yadda) I'll be making a batch for Rosh Hashana, I'll be cutting the carrots into coins, another tradition to signify the hope for a prosperous year as well. This is one of my fall-back fail-safe recipes. I make it all-year 'round because it is easy. I also serve it to company because they (the hens) look so elegant that they (the guests) will think you cooked all day. My copy of the recipe is around 20 years old. But the recipe must be popular since the original can still be found at the Golden Blossom Honey site. As an alternative, you can substitute a chicken, quartered or in eighths (skins on). Place the orange slices and garlic cloves in the roasting pan then lay the chicken parts over them. After the step where the heat is lowered to 350F, roast for only 15-30 minutes longer. Here's a cake that is elegant enough to serve for Rosh Hashana dessert, yet relatively easy enough to impress everyone at your next Hadassah meeting. I adapted this recipe is from an old Family Circle magazine; the issue it was in is conveniently not printed on my clipping, but the original recipe is available on the FC website. If you have nut allergies, then by all means leave out the pecans. Otherwise, leave them in. The few minutes it will take you to toast, chop and add them are truly worth your time and effort.